Hello everyone! I want to thank Dawn and Kera for allowing me to co-host this weeks Super Sunday Sync #42. It is certainly a pleasure to be here and I hope you will join us in making this the biggest linkup yet! I am a little late in getting my 4th of July decorations done, actually getting them started is more like it! We are working on our deck and it is taking longer than we thought. Hopefully we will be done in time for the 4th. I needed to make something that would not take too much time so I decided to make this 4th of July garland. This was so easy to make and I created it in two evenings as I was sitting on the couch with the dogs on my lap. Here are the directions to make this garland. 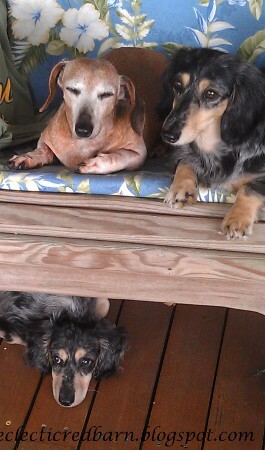 As you may know, I have a 13 year old Doxie, Marina. She is great - sleeps most of the day. As my husband says, "you can't leave well enough alone", I had to get two more Doxies. Caleigh, is 3 and Louie (her puppy) just turned 4 months. See those eyes. They say "mischievous"! So what about the gecko? I am getting to that! Childhood possessions - what lovely memories they generate. I don't have many items that were mine as a child but I cherish the ones that I do have. One item is this doll box, although I no longer have the dolls or any clothing. It has a tray that lifts out. 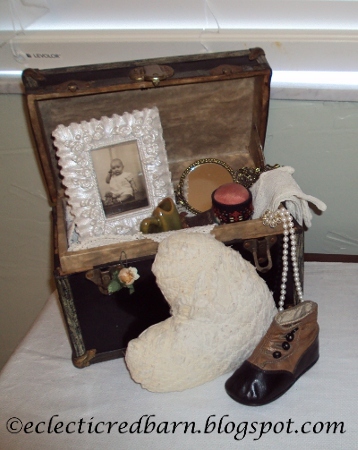 I placed some items in the top of the box that I have collected over the years - small mirror, gloves that were mine, shoe pin cushion, little iron pitcher, pearls, and a photo of me at 6 months. Notice the lack of hair. Didn't have much until I was 2 and then it came in curly and is still that way. Life is a cup to be filled, not drained! It is a lovely afternoon here in Florida. The rain ended earlier this morning and the sun is out. So I thought, why not take a few minutes and go out on the deck and enjoy some tea. Do you find that you like something hot on a "hot" day? I do, what about you? Stephanie posted these money bouquets that she made for birthday gifts. I thought they were so cute. You can read more about her money bouquets at The Enchanted Rose. I put them in my memory for future birthday ideas. Yesterday was my husband's birthday. We do not get much into gifts these days, but I wanted to do something special - make him a cake. His favorite is devil's food with chocolate butter cream frosting. Nothing fancy! But what to put on top? Today, I am delighted to have Eva Stephen from Home Interior Design as a guest host writer. She is a writer, blogger, DIYer, design enthusiast, choosy about colors, nature admirer, social media addict, chocolate fan, and mango lover. I hope you enjoy her post! In home décor retro is the new 'now.' Even if your home has all the mod cons, latest gadgetry and shiny new furniture you can add a touch of vintage warmth to any room. You have great freedom of choice in your particular decade of retro, with everything from the 1920s to the 1980s making a comeback in interior design and on the catwalk alike. You can choose to remodel the entire room, or just add touches of retro glamour here and there to hint at homage to days gone by.